1. Pre-heat the oven to 180C Fan / Gas Mark 4 / 350 F Conventional oven. 2. Mix all the ingredients (except the sprinkles) in a standing mixing bowl on high until thick and creamy. Place into a freezable container and spread out. Place in the freezer for 8 hours. 1. Mix together dry ingredients in a bowl and set aside. (Flour, Cocoa Powder Baking Powder). 2. Cream Butter and Caster Sugar together until light and fluffy (3-4 minutes). 3. Add the egg, mix in until combined. 4. Add red food colouring to the bowl and then slowly add the dry ingredients to the mixer and mix on low. 5. Turn the dough out onto clingfilm, press into a disk, wrap well, and refrigerate for 30 minutes. Roll dough out to 1/8inch thick on a well floured surface. 6. 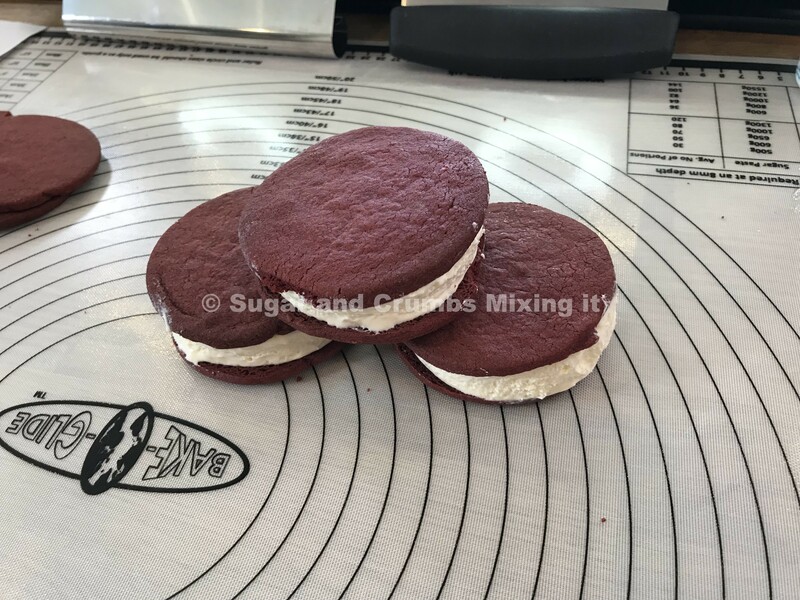 Cut circles out of the dough and transfer to 2 parchment lined baking sheets. Re-roll any dough scraps to cut more cookies. 7. Poke holes in the cookies with a fork and refrigerate for 30 minutes. 8. Bake cookies for 7-8 minutes for soft cookies, 8-10 for crunchier cookies (the crunchier cookies hold up better to all the handling/smooshing/filling). 9. 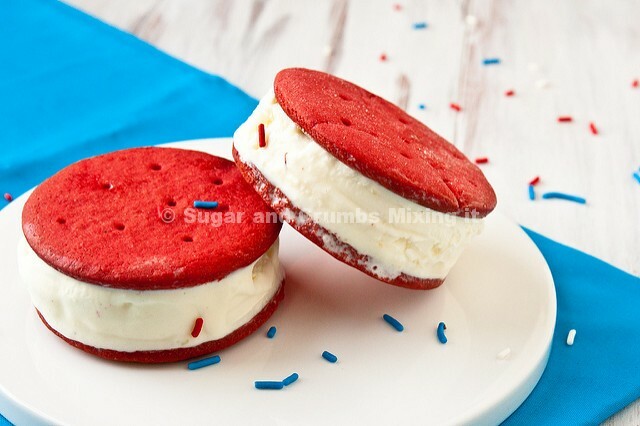 Let cool before sandwiching cookies with Ice Cream. 10. Place into the freezer for at least 15 minutes to refreeze the Ice Cream. Here is the link to the YouTube video tutorial for this recipe: https://youtu.be/JldXBfLKeBk.